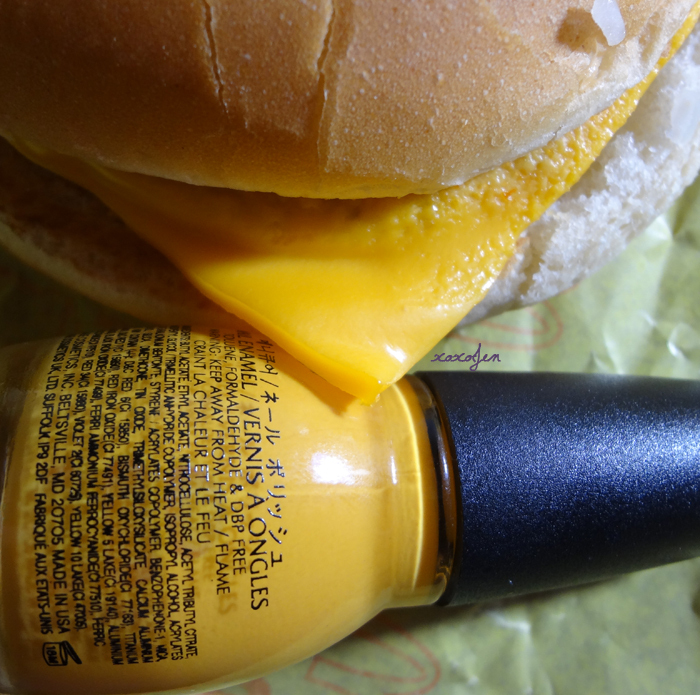 This is Sinful Colors Pull Over and a McDonald's cheeseburger. And here it is swatched, 2 coats over gelous base coat, no top coat. This will become undies for my next mani - any guess what it might be? Oo it is! I hadn't thought of that! It'd be great with some cornucopia nail art or fall leaves, what a great idea! Superhero, maybe?? ;) Can't wait to see whatever goes on it! Thank you! I was quite surprised at how it looked on the nail! This pic cracked me up in npe ;p love it. Glad you got a laugh, and thank you for visiting!